How important to you is the motor’s weight. There is a trade-off between power and weight, namely that the more powerful the motor, the heavier it is, and the harder it is to carry it. In any case, the motor should be a 20″ log shaft (L) model, and not a 15″ short shaft (S). Another important trade-off that you should be aware of is related to propellers: High pitch propellers are designed to deliver more speed and less torque (thrust, push force), and they work best with lightweight boats such as the S4, while low pitch propellers are designed to move bigger and heavier boats at lower speeds, but they should not be used with lightweight boats such as the S4, since they might make the motor run at a too-high RPM. Outboard motors manufacturers’ websites say that (quote) “UNDER NO CIRCUMSTANCES SHOULD YOU EVER USE A PROP WHICH WILL ALLOW YOUR OUTBOARD TO OPERATE ABOVE THE OUTBOARD’S RECOMMENDED MAXIMUM RPMs“. This means that you should avoid using propellers designed for use with very heavy boats, namely propellers in the low-pitch range. Note that 20″ long (L) propeller shaft motors typically ship with propellers that are not necessarily optimal for very lightweight boats such as the S4. For example, the 6 HP 20” long (L) outboard from Tohatsu often comes with a medium range 8 pitch propeller, which is fine, but mounted on the S4, such a motor could drive the S4 12% faster if outfitted with a 9 pitch propeller. Propeller pitch information is available on outboard manufacturers’ websites. Since the S4 is a very lightweight boat, you should preferably outfit the outboard motor for it with the highest pitch propeller available for it. Diameter – Don’t try to use a propeller from a small outboard with a bigger outboard, or vice versa. A hydrofoil is an add-on device attached to the outboard motor’s propeller shaft (a.k.a. “leg”). The hydrofoil generates lift at the boat’s stern – The higher the speed the more lift. Hydrofoils can help correct various problems that a powerboat may have, but the S4 has no problems that require correction. This said, hydrofoils help keep the bow down and the stern higher, and a boat that travels this way, namely in a more level position, planes better than if its bow was higher and stern lower. Therefore, outfitting your S4’s outboard motor with a hydrofoil device can result in higher speed on flat water when driving in a solo mode, that is without a passenger in the front. The downside of using a hydrofoil is that when driving with a lowered bow in the ocean, the boat might generate more spray as it bumps into big waves, especially if there’s a passenger in the front. Bottom line: If you like driving solo at high speed on flat water, consider adding a hydrofoil, and if you need to drive in big waves with the hydrofoil on, trim the motor less aggressively by using its trim angle adjustment rod, or knob, especially if you have a passenger on board whose presence also works to lower the bow. For the S4, small size means a highly portable but under-powered outboard motor. Outboard motors in this class weigh around 30 lbs, which makes them fully portable even for a user who’s not very strong. A 2 HP motor can propel an S4 skiff with one person on board at speeds up 8 mph, even in choppy water. This speed would decrease as the boat is required to carry more passengers on board. S4 owners who tested such motors with their S4 skiff reported that the boat felt under powered, which means that they felt like going faster, but the motor lacked the power required for this. For this reason 2 HP motors are not popular with S4 users. Another reason for their lack of popularity is the fact that being air cooled makes these small motors noisier than bigger, water cooled motors. For the S4, a medium size outboard motor means powerful enough but still portable. Motors in this 3.5 HP to 6 HP range are the ones we recommend for most users. Outboard motors in this range weigh around 40 lbs, which makes them still portable, but less so than 2 HP motors. A 3.5 HP motor can propel an S4 skiff with one person on board at speeds up to 11 mph, even in choppy water, and it can propel the boat at 8 mph with three passengers on board in moving water. This size motor is popular among S4 and W700 users, as it offers a good trade-off between power and weight for people who must lift the motor or carry it by hand over long distances. These motors are also less expensive than bigger ones. For their 3.5 HP motor, Tohatsu recommends either the 7 pitch (Plastic) or 6 pitch (aluminum) propellers, for lightweight boats such as the S4 (under 500 lbs). We say get the 7 pitch propeller, unless you think that you need the more durable aluminum propeller. Outboard motors in this range weigh around 60 lbs, which makes them portable only over short distances, and not for everyone. A 6 HP motor can propel an S4 skiff with one person on board at 17 mph, and it can propel the boat at 12 mph with three passengers on board. 6 HP is the second most popular motor size among S4 users. For their 6 HP outboard used with lightweight boats up to 500 lbs (such as the S4), Tohatsu recommends their 9 pitch propeller. The 8 pitch propeller would work too, especially if you intend to have the boat fully loaded, so that it would weigh over 500 lbs in total. 8 HP to 10 HP outboard motors are too heavy to be carried by hand, and they may be too powerful for inexperienced drivers to use safely. However, some of them come with electric start instead on manual start, which is a nice feature. They also come with an alternator that can serve to power small electric devices on board. Outboard motors in this class weigh between 65 and 80 lbs. At such weight, these motors can no longer be considered as portable, and the main reason to use them is the fact that are offered with electric ignition, which eliminates the need to start them by pulling a cord. People who like driving at high speed may prefer these motors to less powerful ones. The S4 outfitted with an 8 HP motor performs well in choppy water, but it could feel over powered for an inexperienced driver, which should avoid using such motors with their S4. Heavy users may benefit from driving with a U-jointed tiller extension, in order to move some weight forward from the stern towards the middle of the boat. Note that these bigger motors don’t come with an integrated fuel tank, but this isn’t necessarily a problem, since external fuel tanks can fit inside the S4’s hulls. We tested the S4 with a 9.8 HP Tohatsu and a 9.9 HP Yamaha outboard, and it worked well. Practically, this class of heavier and more powerful motors offers no advantage over smaller motors unless you’re a speed fan, and you’re also capable of driving small boats safely at such speeds. To those who want to take the risk of overpowering their S4 with such big motors, we recommend reinforcing the mounting plate. Currently, the S4 is the world’s fastest designated kayak. 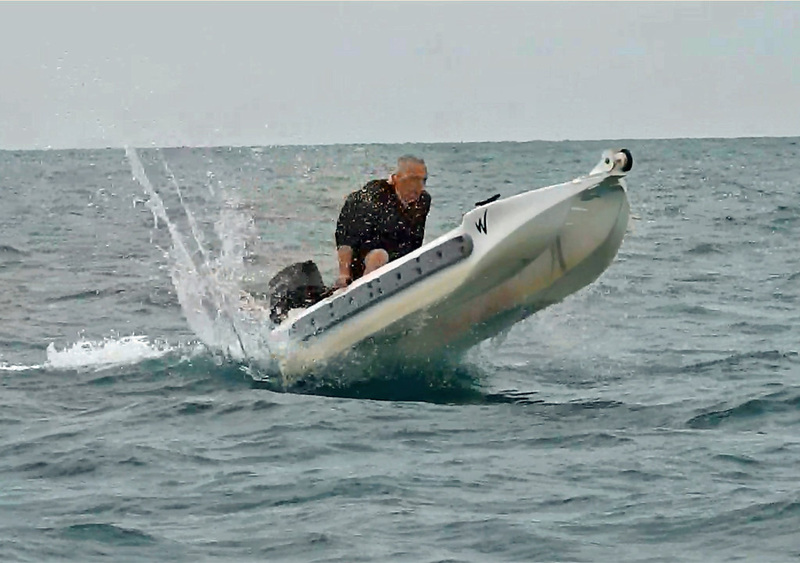 The 17 mph kayak speed record was achieved by Captain Larry Jarboe, of Key Largo, Florida, in his S4 outfitted with a 9.8 HP Tohatsu outboard motor. Incredible as it may sound, Wavewalk S4 owners have been experiencing with such extremely powerful motors as well. The 15 HP motor tested was a new, 4-Cycle Suzuki that weighed 135 lbs, and it was too heavy to be effective. In other words, the extra power did not add to the boat’s speed due to trim issues. The owner switched a 9.9 HP 4-Cycle that weighs 105 lbs, and they are satisfied now. The 18 HP motor was an old 2-Stroke Mercury that weighs less than 100 lbs. It was outfitted with an 11″ pitch propeller. The S4 powered by this outboard motor did not break the 17 mph speed record achieved with a 9.8 HP Tohatsu (same manufacturer), apparently since the motor needed refurbishing. If this is done, and the motor is properly trimmed, we expect it to deliver a new top speed for the S4. We recommend that inexperienced drivers avoid using high power motors with their S4. Instead, they should pick a motor within the 3.5 HP to 6 HP range. After years of testing motors and getting input from our clients, we can recommend all Japanese brands, namely Honda, Suzuky, Tohatsu and Yamaha. Mercury is a Tohatsu brand, and the small, portable motors offered by Evinrude are made by Tohatsu. Motors from all these brands are good, and your decision about which motor to use with your S4 should be based on factors such as price, weight, features, availability, warranty, etc. A kicker motor is a name given to any outboard gas motor used on a big boat for trolling, or as a spare motor, and for positioning and driving sailboats over short distances when sailing them is not possible. Being used on bigger boats, kickers often feature a 20″ long (L) shaft, which is the right size for the S4, but the propellers used with them are typically low-pitch models that are not optimal for lightweight boats such as the S4. If you buy a kicker, check its propeller, and if it’s not a model with the highest pitch that the manufacturer recommends for lightweight boats, replace it with such a propeller. Most motors feature a surface drive, and they offer a huge advantage to people who want to drive in very shallow water, mud, water with many underwater obstacles, and water with plenty of vegetation. Mud motors are bulkier and heavier than regular outboard motors of similar power. A 3 HP long tail mud motor weighs about 40 lbs, and as such it’s portable. It works well both in flat water and streams, although not very fast ones. The S4 can definitely use much more powerful motors. A 6.5 HP mud motor weighs around 80 lbs, and it’s not portable. The reasons you’d want to use such a motor instead of a regular outboard of similar power are if you need to go in very shallow water (skinny water) and mud, and if you fish or hunt in water with plenty of vegetation and underwater obstacles. The S4 performs very well with a such a mud motor. We do not recommend using less powerful mud motors because typically, these motors require more power than regular outboard motors do. Typically, electric trolling motors are not powerful, and they are designed to propel heavier boats than the S4 (e.g. bass boat, skiff, Jon boat) at a very low speed, namely trolling speed. This type of application requires high thrust (small pitch) propellers, and it’s also the reason why trolling motors are rated in thrust units (lbs) and not in horsepower (HP or KW) – When you buy such a motor, your primary interest is how big (heavy) a boat it can move, and not at what speed. No amount of words can overcome this reality. In view of the Wavewalk transition to portable motorized twin hull skiffs (the S4 series), I have been finding and refurbishing small long shaft outboards for my customers to compare. No other kayak dealer that I know of will demo their product with a motor capable of planing the vessel. I also offer these motors for sale at less than half the price of a new long shaft outboard. I’m sure your clients appreciate this service. I just tested 2Hp Honda and indeed there is room for more power. Will get a 6Hp next year. Yesterday I drove the S4 with the 6 HP Tohatsu at full throttle at the beach. BTW, this motor’s user manual states that it can propel boats up to 3,000 lbs. I guess this means a sailboat maneuvering in a harbor. Anyways, driving was a lot of fun, both sitting and standing, and playing with waves and other boats’ wakes. I drove at full throttle all the time, including while turning. And this is where I need to make it clear that I’m not exactly and experienced driver. Pulling the 6 HP motor from the car and mounting it on the boat was OK, but I would have not made it with a heavier engine. My own opinion is that the S4 will easily accommodate as much motor as your back will. Thus, choose the most horsepower that you can sensibly lift. I look forward to enjoying my day seated inside my Wavewalk not lying on top of a chiropractor’s table. Been there. Done that. Will look out for my back to avoid going back. Yep, this is good rule of thumb.